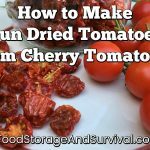 I post a lot of survival and food storage information on this blog including “how to” and instructional posts. To the best of my knowledge I am not asking you to do anything dangerous. Regardless, I am posting this disclaimer. Read and try these activities at your own risk. I am not responsible for any injury, illness, accident, bewildered spouse, eye-rolling child, or alien invasion that might occur from attempting any project posted about on my blog. By reading this blog, you agree to take full responsibility for yourself and your actions. Now we’ve gotten that out of the way, don’t worry. You’ll be fine. Go do something to get better prepared!